U.S. President Donald Trump on Friday, January 25. Robert Mueller, then director of the FBI, testifies before the Senate Judiciary Committee on June 19, 2013. We were initially going to focus on a lot of different issues of what was going on in the administration [and in] other departments. ... What did the Trump administration really look like? What did [the Trump presidency] mean for education policy or housing policy and such? Very quickly everything we did was consumed by the Russia investigation and by covering that. And that basically became the Russia team. We spent the early part of 2017 trying to feel our way through this story. As someone that gets to see this play out every day, or every few days, or a couple of times a week, the reason that a lot of stories are broken [is] because journalists are out there asking people questions. We are not lemmings sitting at our desks who receive calls from folks that are trying to secretly undercut the other side and use anonymity to launch an attack. A lot of times these stories arise because reporters are talking to a lot of different people and taking small pieces of information they're able to glean from one conversation and using it to have another conversation and to build on it. Their calculation is that public opinion will dictate how the House of Representatives looks at the president's conduct. And part of that strategy has been to throw a lot out there, throw a lot on the wall, to make the average person say, "I'm not really sure what's going on here." And maybe that benefits the president. There is nothing in the rules and laws that allows Bob Mueller to write a report as long as he wants and [to] give it to Congress. All he can do is report to the attorney general about who he prosecuted, who he didn't prosecute and what he found. The attorney general is only required to tell Congress about those instances in which Mueller wanted to take investigative measures or moves, like indict someone and was stopped from doing it. That is the only thing that has to be told to Congress. The problem is ... that the public really wants an accounting of what went on. They want a 9/11-style commission answer to what happened — but that doesn't exist. So what will happen? How much will Congress get? It's not really clear. It's not like he has this ability just to hand over everything that he found to the Hill and for the Hill to do whatever they want with it. That structure is not there. Amy Salit and Seth Kelley produced and edited the audio of this interview. Bridget Bentz, Molly Seavy-Nesper and Martina Stewart adapted it for the Web. This is FRESH AIR. I'm Terry Gross. My guest Michael Schmidt is part of the team at The New York Times that's reporting on the Mueller investigation and on connections between Trump, his associates and Russia. The team, which won a Pulitzer Prize last year, formed in the Times' Washington bureau right after Trump's inauguration to investigate emerging issues surrounding the Trump campaign and Russia. By early February, Schmidt and reporters in the team broke the story that Trump campaign ads had repeated contacts with Russian intelligence. In May 2017, Schmidt revealed that Trump had asked FBI Director James Comey to pledge his loyalty and to end the investigation into Michael Flynn, Trump's first national security adviser. Last month, Schmidt was one of the Times reporters on the story that after Trump fired Comey, the FBI opened a counterintelligence investigation into whether Trump was secretly working on behalf of Russia and posed a threat to America's national security. During the presidential campaign in 2016, Schmidt was the first reporter to write that Hillary Clinton exclusively used a personal email account while she was secretary of state. Schmidt co-wrote the articles with Emily Steel on Bill O'Reilly's alleged sexual misconduct that led O'Reilly to lose his show at Fox News. Schmidt and Steel were part of a team that won a Pulitzer Prize last year for exposing powerful and wealthy sexual predators. Michael Schmidt, welcome to FRESH AIR, and thank you for your reporting. So you're covering the Mueller investigation into Russia. When you put that together, what's - with what's happening in the Southern District of New York, which is investigating Michael Cohen and got his papers and is now investigating Trump's inaugural committee's spending, how does the picture change when you put both sets of investigations together? MICHAEL SCHMIDT: I think when you take a step back and you look at the entire playing field in front of the president, there's a lot of different investigators rummaging around in different parts of his life: his administration, his campaign, his inaugural committee, his business. It's just sort of striking. And it's one of the harder parts of the story at this point - is that there's just so many different tentacles, and they're all sort of their own language, their own subjects where you have to master all of these different things. And it's pretty difficult to keep up with. SCHMIDT: And I often think a lot of times, Rudy Giuliani says things that are not true and is called for it appropriately. I also think one of the problems he has is that this story is so complex, and there are so many different things you have to know. And he thinks you can go out and talk about all of them. And that's what creates a lot of the problems - is that he doesn't know what he's talking about, and he doesn't consider the implications of what he's saying. And what I've never been able to figure out is whether this is truly something they are doing to confuse people, to muddy the waters, to try and make this - the president say, look. There's all this stuff going on. It's really confusing. These investigations - as a way of sort of helping public opinion in his favor because they have made a calculation that public opinion is the most important thing to them, that that is the only issue that they have, that the president does not have legal issues. He has political issues because the House of Representatives is the only place that can hold him accountable and could impeach him. So I always wonder, why is Giuliani out there? What is the true motivating force behind that? GROSS: So you think confusion might actually be a tactic that Trump is using. SCHMIDT: I do, and I think that there's a tendency by the president and by Giuliani to just throw a lot of stuff out there, even - put aside the Russia investigation, all the investigations. The president often says an enormous amount of things. He's talking about a lot of things. On the campaign trail, he was talking about a lot. When he's tweeting, he's talking about a lot. And if you're the average American and you're not watching it as closely as I am every day, you sort of see all this stuff and you're like, well, what's really going on here? And their calculation is that public opinion will dictate how the House of Representatives looks at the president's conduct. And part of that strategy has been to throw a lot out there, throw a lot on the wall to make the average person say, well, you know, I'm not really sure what's going on here. And maybe that benefits the president. GROSS: I want to ask you about a major story that you broke January 11 along with your colleagues at The New York Times, Adam Goldman and Nicholas Fandos. And you wrote that in the days after Trump fired Comey, law enforcement officials became so concerned by the president's behavior that they began investigating whether he'd been working on behalf of Russians against American interests. And this was according to law enforcement officials and others familiar with the investigation. You write, (reading) counterintelligence investigators had to consider whether the president's own actions constituted a possible threat to our own national security. Agents also sought to determine whether Trump was knowingly working for Russians or had unwittingly fallen under Russia's influence. So it's a pretty frightening thought to think that the person who's now president of the United States had knowingly or unknowingly been working against America's national interest and that law enforcement officials were considering opening a counterintelligence investigation against Donald Trump. So was a counterintelligence investigation opened? GROSS: And what do you know about it? SCHMIDT: The FBI was deeply concerned about what was going on around them. The president had just fired Comey. The FBI knew - and it wasn't public at the time, but the FBI knew that the president had asked Comey to do these things - to end the investigation into Mike Flynn, to say publicly that the president wasn't under investigation, that the president had asked Comey for his loyalty. So they knew there were all these sort of weird events that had gone on. They had seen what the president said in his interview with NBC with Lester Holt where he said that Russia was on his mind when he fired Comey. And they looked at the totality of this, and they could not understand what was going on and what was the true reason for getting rid of the FBI director, for taking such a drastic move. And they saw it - the senior FBI officials - as a potential national security threat because they knew there was this really important investigation going on into Russia's meddling in the election. They knew that getting to the bottom of that was very important to the security of the country, to protecting our elections and to understanding how a foreign adversary had tried to impact us. And here they had the president getting rid of the person overseeing that investigation, later telling the Russians in the Oval Office in a meeting that by firing Comey, he had relieved a lot of pressure on himself. GROSS: So the counterintelligence story that you broke is a very dramatic story, a very disturbing story - very disturbing to think of the possibility that, you know, the president of the United States was working against our own country's interest and working on behalf of Russia's interests. What was your reaction when you got onto this story? SCHMIDT: I think that as journalists who have covered this, we have lost - not completely lost - but to some extent, lost the ability to be shocked. We have written and been a part of or been beaten on stories in the past two years plus that are things that we had never seen before and never really fathomed. And now they kind of come and go in ways that are sort of normal. And I knew it was a big deal, and I knew that it was significant. But I've sort of shied away from getting worked up or tied to them in any type of emotional way, one, because it could sort of skew the way that I look at things, but also because it's hard to be surprised. At the end of last year, I wrote a story about how the president had discussed with his White House counsel how he wanted to have the Justice Department investigate Hillary Clinton and Jim Comey and essentially use his powers to force an investigation on his political rivals. I thought that was pretty significant. If that type of story had been written about any other president, my guess is it would've dominated at least that month, if not year, of that person's presidency. And in this case, it was a story - and it got a lot of attention. GROSS: So kind of like - incredibly big stories can become background noise if you get so acclimated to the fact that there's always breaking news about possible wrongdoing within the Trump administration or campaign. SCHMIDT: Correct. 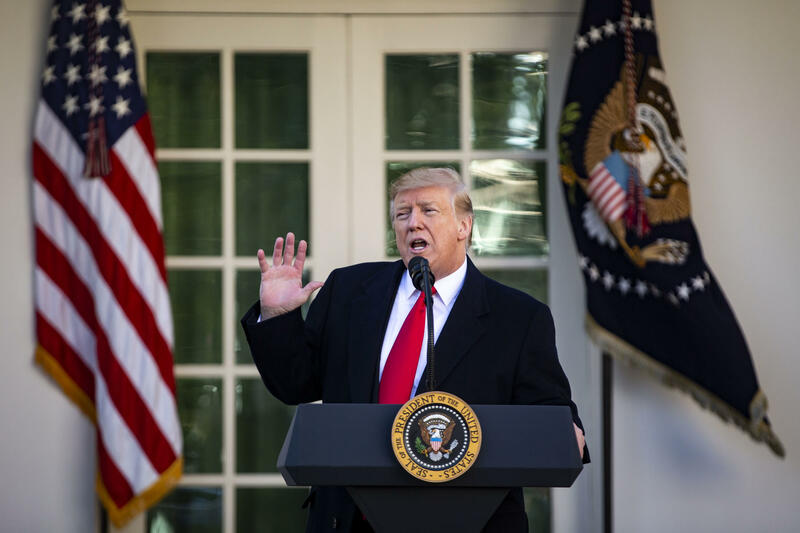 And then the president would come out on the South Lawn and say three highly unusual or different things about three varying subjects, and the collective media attention is off in a different direction. I understand why the media does that. I'm part of that. We all get caught up in the different things the president says or does and sometimes chase that - and for good reason. The president says things that are not accurate, that are offensive to many that have to be covered and cannot be ignored. But when that happens, we start to sort of lose sight of some of the larger things. So will there be any type of resolution to many of these different things that we've written about him where we get more clarity on what happened? Or will everything just kind of come and go in this sort of large churn? And that can be a frustrating part of covering it. GROSS: Let me reintroduce you. If you're just joining us, my guest is Michael Schmidt. He covers national security and federal investigations for The New York Times. And he's been covering the Mueller investigation and possible connections between Trump, his associates and Russia. We're going to take a short break, and we'll be right back. This is FRESH AIR. GROSS: This is FRESH AIR. And if you're just joining us, my guest is Michael Schmidt. He covers national security and federal investigations for The New York Times. He's been covering the Mueller investigation and ties between Trump, his associates and Russia. Trump's response to your story about the counterintelligence investigation - he sent out a lot of tweets, including (reading) wow, just learned in the failing New York Times that the corrupt former leaders of the FBI, almost all fired or forced to leave the agency for some very bad reasons, opened up an investigation on me for no reason and with no proof after I fired Lyin' James Comey, a total sleaze. He also wrote, (reading) my firing of James Comey was a great day for America. He was a crooked cop. What's your reaction when Trump fires off tweets like that about stories that you, you know, wrote or co-wrote? Do you feel a need to respond? I mean, you're not terribly active on Twitter. Does it concern you when he does that? Do you just ignore it? Do you get trolled a lot, you know, either, you know, in social media or get, you know, threats by phone or in person after Trump tweets like that? SCHMIDT: No. It doesn't concern me too much because he has to go out and defend himself. And what we write, he's going to go out and do that. I thought he might have been - at least coming into the end of the story and the publishing of the story, I thought that he may have a very smooth sort of way of saying, look; I told you all along there was a deep state. It's out to get me. Look at what they did. That's sort of what he's saying in the tweet. GROSS: Did you get separate messages by phone or email from the communications office of the White House after a story? SCHMIDT: There isn't a lot of that. In Trump's world, there's sort of him sort of shouting at you from his Twitter account. And there's stuff from his supporters, and then it kind of goes away, and they move on to something else. It's not as organized or sustained when they come back after us. They're not looking to try and use little problems in the story to try and undermine the larger part of it. They just say - you guys are a bunch of liars or you're on the take - and move on. The important part of the president's criticisms of the FBI and the decision to open the counterintelligence story is part of the story that I think sometimes gets overlooked. And that's the text messages that came out from the lead agent, Pete Strzok, who was the top FBI counterintelligence investigator. He oversaw the investigation of Hillary Clinton's emails. As soon as that investigation was over, he opened up the Russia investigation. And what happened at the end of 2017 is that we wrote a story. We broke a story about how he had these text messages that he had exchanged with another FBI employee in which he expressed his political views about Trump. He expressed his political views about a lot of politicians. His use of Trump got the most attention. And there's been no evidence that there was political bias in how the investigation of Trump was handled or whether the FBI was lighter on Hillary Clinton because of that. But what it did do is it gave the president enormous ammunition to go after the FBI and to try and question its credibility. And I remember exactly where I was when I found out about this. And I knew that for the president it would be a significant game-changer because it would allow him to say see, look, these folks, they don't like me. They are out to get me. And in terms of the larger narrative, an arc of the Trump story, when you go back and you look at the end of 2017 and this development, it was something that really helped the president's side. And conservatives and Fox News and Sean Hannity really rally against the investigation and start to plant the seeds of doubt. But in terms of undermining Mueller's credibility, the FBI's credibility, it was a turning point. GROSS: So what is your reaction when you break a story like the Peter Strzok texts and it ends up being ammunition for the president to discredit the FBI? Now, I know you're breaking stories without the intent to have them function on any person's side. You're just trying to get to the facts and to the truth. Nevertheless, when you see it used as a way for Trump to discredit our intelligence agency, what's your reaction? SCHMIDT: I think that if you're going to sign up to do this in this atmosphere, you sort of have to go as hard as possible after the facts and sort of watch what happens with them. And as long as your stories are accurate and are reflective of what happened, that is really all that I can worry about. If I start to worry about how things are going to influence other parts of the story then you sort of start to head down the path of trying to put maybe one finger on one side of the scandal or another. You don't want to say, well, if I do this, it's going to help this or hurt this. You understand the implications of what you're doing. But as an investigator, it's like, look, I'm just going to follow the facts wherever they go and report them, and that is really all that I can control. And there will be right and wrong answers about what happened. Either certain events happened or didn't. And over time, they will come out. And as a reporter, I believe I will be judged based on the accuracy of my coverage against what really happened. And if I focus on that then I will have done the best job possible. I will have protected myself, and I will have given our readers the most accurate picture of what's going on. And that's it. That's all I can do. I can't do or worry beyond that. GROSS: My guest is New York Times reporter Michael Schmidt, who has broken major stories about the Mueller investigation and ties between Trump, his associates and Russia. After a break, we'll talk about a story he broke during the 2016 presidential campaign that Hillary Clinton, while serving as secretary of state, exclusively used a personal email account. I'm Terry Gross, and this is FRESH AIR. GROSS: This is FRESH AIR. I'm Terry Gross. Let's get back to my interview with Michael Schmidt, a Washington correspondent for The New York Times who's been covering the Mueller investigation and connections between Trump, his associates and Russia. Schmidt was part of two teams that won Pulitzer Prizes last year, one for coverage of Trump and his campaign's ties to Russia, the other for exposing powerful and wealthy sexual predators. The related sexual predator stories he co-wrote were about allegations against Bill O'Reilly. Many of Schmidt's articles about the 2016 presidential campaign and the Trump presidency have had enormous impact. So one of the stories that you broke was about Hillary's emails, which was in March of 2015 during the campaign. You broke the story that she exclusively used a personal email account while she was secretary of state, possibly breaking the Federal Records Act, which requires you to preserve emails because her aides didn't take action to have the emails on her personal server preserved on department servers. What did you originally think the significance of that story would be? SCHMIDT: The evolution of that story was interesting because in the reporting, I knew that there were personal emails of hers that the Benghazi committee - the committee that the Republicans had set up on the House to investigate the attacks and basically Hillary Clinton's role in how that was handled - I knew that the committee had these personal email messages. But it wasn't till the end of the reporting, right before I was about to publish that I learned that she did not have a State Department email account. And she was using this personal account to do government work. So at the end of that reporting, that was a pretty significant fact because it showed that her email system had operated very differently than any other government official. GROSS: So that story played out in a lot of surprising and major ways. It helped her lose the election. It helped President Trump justify firing James Comey because he referred to a memo written by Deputy Attorney General Rod Rosenstein criticizing Comey for how the email investigation was handled by the FBI. What surprised you most about how this story played out? SCHMIDT: I guess how long it went on. I remember, a week or so after this story, being at a dinner with some work colleagues, and one of the work colleagues saying to me - do you think this story will be around in another week? And I thought that maybe this story had a month-long shelf life at the time - meaning that it would've been over by April of 2015 - and I didn't think it would have the legs - and continue to have the legs it does even now, where Republicans are calling for the Justice Department to look at this issue once again to determine whether she should have been prosecuted. GROSS: As the story of the Mueller investigation and ties between Trump, his associates and Russia continue to play out, the - seem to be, like, more and more leaks. And, you know, I don't know who the leakers are, but it seems it's probably a combination of people who are investigating Trump, as well as current and former Trump associates. And, you know, some of the reasons for leaking might be to settle scores, or seek revenge, or to, you know, get to the truth, to make sure Americans know what's really going on. I'm sure there's a whole range of motivations. How are you - how can you explain the amount of leaking that seems to be going on now from, you know, various directions? And I know it's not something you can speak about in detail because that's your job, of course, to protect your sources. But whatever you can tell us about this, like, leaking atmosphere would be really interesting. SCHMIDT: One of the unfortunate things about stories based on anonymous sources is that - how we got this story and who the sources are often takes on a life of its own. And I think that at Times, there's this, sort of, notion that we receive leaks as if - I know it's not this simplistic, the idea of it - but, like, as if we are sitting at our desks and the phone rings and it's the leaker who has the information for us. GROSS: Well, I have to confess. I did think that was, sometimes, how it happens - and I think, in fact, is, sometimes, how it happens - isn't it? SCHMIDT: As someone that gets to see this play out every day - or every few days - the reason that a lot of stories are broken is because journalists are out there asking people questions. We are not lemmings sitting at our desks who received calls from folks that are trying to secretly undercut the other side and use anonymity to launch an attack. A lot of times, these stories arise because reporters are talking to a lot of different people, and taking small pieces of information they're able to glean from one conversation and using it to have another conversation, and to build on it. And it's unfortunate that we can't always show our homework because we're protecting people. But, more times than not, it's because the journalist is out there trying to piece together small little strands into a larger thing, that we get the stories that we do. GROSS: You've taken on a huge responsibility in the sense that - for instance, the email story that you broke about Hillary Clinton helped lead to her defeat in the election, whereas, the stories you've been breaking about Trump and his and his associates connections with Russia, and stories you've broken about the Mueller investigation, could possibly help lead to the president's impeachment in the sense that the House would unlikely impeach him unless they felt there was enough popular support for it. And you could argue that your stories are revealing information that could help lead to popular support. So, I mean, there's a lot resting on your reporting, it's having a huge impact on public opinion and on, you know, who sits in the White House. How do you deal with that responsibility? I mean, it's - if you get something wrong, that's really terrible, if you get it right, it can have a huge impact on the country. SCHMIDT: ...the Clinton email coverage, I think, prepared me for this moment. I found that the Clintons are, in some ways, more challenging to cover than Trump, just as a journalist, because they will push back and be so in in your face, and are ready to litigate and fight you at every corner. The president, for as loud as he is, is less sophisticated in the media area. Hillary Clinton has folks that work for her that are top Washington lawyers, that are really seasoned PR folks, that know how the game works. The president doesn't have that strong of a bench. He has a big megaphone, and he stands on the highest point in town, and he screams at you, and he says - you're full of it, and you don't know what you're talking about, and you're fake news - and then he, kind of, moves along. He doesn't have the legions behind him in the way that Clinton does to really force you to defend, and be willing to sustain a real good fight about what you've written, and that sort of comes with it. If we're going to write big stories, we're going to have lots of people pushing back on us. GROSS: And you can control the anxiety of dealing with all of that. SCHMIDT: At the end of the day, the facts are my best friend in that if I wed myself to the facts and pull down and hold the roots of the facts and follow them, then that is the best protector and shield that I have. And if I get up in the morning and that's what I'm thinking about, and I'm not thinking about, do I like the president? Do I not like the president? Do - does something the president do bother me or not bother me? If it's simply like, OK, we're out here to cover this story, and that is what you're focused on, then I think you can get yourself - we're not perfect. We're going to make mistakes, but that gets yourself to a better place. There are a lot of folks in this country on both sides that have enough emotion and feelings about what's going on that I don't need to interject my feelings or emotions into things. What I think we need is people that are going to cover the story. And the more I focus on that, I think, the better. GROSS: Let me reintroduce you here. If you're just joining us, my guest is Michael Schmidt. He covers national security and federal investigations for The New York Times, and he's been breaking a lot of stories about the Mueller investigation and about connections between Trump, his associates and Russia. We'll be back after a short break. This is FRESH AIR. GROSS: This is FRESH AIR. And if you're just joining us, my guest is Michael Schmidt. He covers national security and federal investigations for The New York Times and has broken many stories pertaining to the Mueller investigation and connections between Trump, his associates and Russia. Take us back to the very beginning when you started covering connections Trump - between Trump, his associates and Russia. My understanding is based on what you've said before - is that there was a team of New York Times reporters that got together. And then you sat down and compiled a list of 120 people who might know something and then all started calling them to see what you could find out. Take us back to that early period. When did the - when did this unit - if you can call it a unit - start? Where did you fit into it? And what were those early days like? SCHMIDT: So right after Trump won, my colleague Mark Mazzetti, who was an intelligence reporter, really understood and got the severity in the moment. And there had been discussions at the Times to create sort of an investigative group to focus on Trump in the aftermath of the election, as he was coming into office, to be based in Washington. And Mazzetti understood the need for this and took on the role as the editor of this group. And there were several reporters that were assembled into it. I was one of them. And we basically, in hindsight, I think, laughingly would say that we really didn't know what we were doing at first 'cause we didn't really know what the story was. But we knew that with the president coming in, there was going to be a lot of different areas to look at. We knew there was these emerging questions about Russia, what Russia had done in the election. And we basically set out, throughout the transition and then after January 20th of 2017, to focus on this. We were initially going to focus on a lot of different issues of what was going on in the administration, other departments. Was there - how was this operating? What did the Trump administration really look like? What did this mean for education policy or housing policy and such? Very quickly, everything we did was consumed by the Russia investigation and by covering that. And that basically became the Russia team. And we spent the early parts of 2017 trying to feel our way through this story. And the more that time went on, the better handle that we sort of got on it. And we're able to keep ourselves - we hope or we think - you know, sort of at the front of the line in terms of the coverage on it. 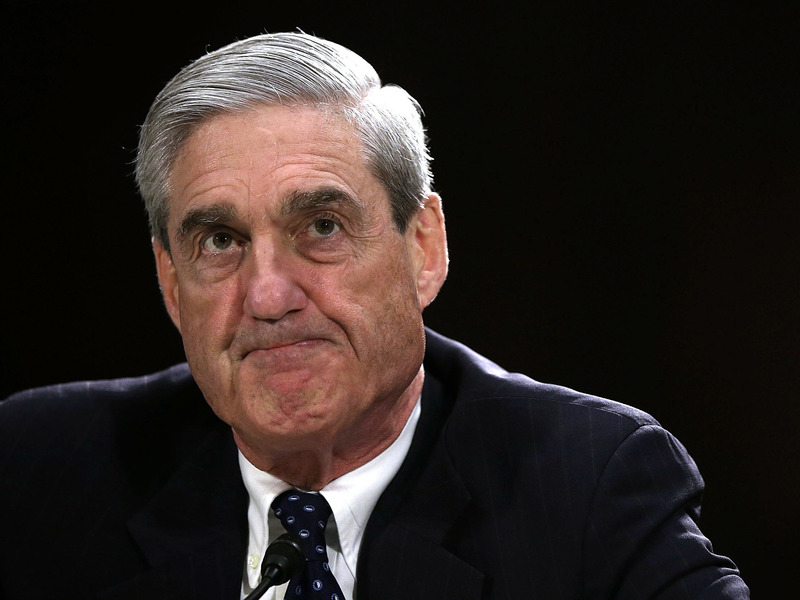 GROSS: What are the odds you think we'll actually see Mueller's report? And part of what I'm wondering here is - I have been wondering if the report is being backed up in outside locations in case the attorney general decides not to make the report published or decides to just, like, put it in the drawer or just release excerpts of it. When I say published, I mean just, like, released to the public. Are there people, like, backing it up and planning to leak it if the attorney general doesn't make it available? SCHMIDT: So I think there's some misconceptions about the report that are important to sort of clear up. We think of a report - and I think many people do - because of the Starr report. Ken Starr, independent counsel, was able to send a fully-throated report - that eventually turns into a book - to Congress about the investigations of Bill Clinton. The - what Ken Starr operated under - the independent counsel statute - does not exist anymore. That enabled a report like that to go to Congress. We're under a different set of rules today. We're under the special counsel statute. It's not even a - it's the - basically a regulation that creates a special counsel. And there is nothing in the rules and laws that allows Bob Mueller to write a report as long as he want and give it to Congress. All he can do is report to the attorney general about who he prosecuted, who he didn't prosecute and what he found. And the attorney general is only required to tell Congress about those instances in which Mueller wanted to take investigative measures or moves, like, indict someone, and was stopped from doing it. That is the only thing that has to be told to Congress. The problem is, is that the public really wants an accounting of what went on. They want a 9/11-style commission answer to what happened, but that doesn't exist. So what will happen? How much will Congress get? It's not really clear. And it's not like he has this ability just to hand over everything that he found to the Hill and for the Hill to do whatever they want with it. That structure is not there. When Janet Reno, in 1999, created this - you have to understand that after Ken Starr is done, there's sort of a belief on both sides of the aisle that he had too much authority, too much power and went too far. So in 1999, they need to come up with a way of, how are we going to investigate folks like the president or senior politicians where there's questions of, is the investigation bias? So they created this thing, which was a very, very toned down version of what existed before it. They say that the notifications to Congress - what we talk about today as a potential report - could be very short, could be a couple of paragraphs, could not be very long. So Bob Mueller was just appointed to investigate whether crimes occurred. He was not appointed to go back, like the 9/11 Commission, and figure out everything that happened. GROSS: But he has figured out so much. So what happens with that information? He's connected so many dots. SCHMIDT: Well, that information is in - that we know about - is in indictments that are public. And if Congress sees things in those indictments and in public documents that it doesn't like, it can take those documents and use them for whatever. If they wanted to start impeachment proceedings off them, they could. That information lives in the indictments that tell the stories that he has told along the way. But the notion that, like, hey, here is the Mueller report that is the authoritative account of how Russia meddled in the election and how the president may have obstructed justice, that just - there may be a demand for it, but it may never turn out to be that cut and dry of a thing that goes and becomes public. GROSS: Michael Schmidt, thank you so much for talking with us and for your reporting. GROSS: Michael Schmidt is a Pulitzer Prize-winning New York Times reporter who has been covering the Mueller investigation and connections between Trump, his associates and Russia. After we take a short break, rock critic Ken Tucker will review hip-hop singles by Lizzo, Lil Peep and 21 Savage, who was arrested by immigration officials Sunday, alleging he's a British national who has overstayed his visa. I'm Terry Gross, and this is FRESH AIR.